Imagine a warm cozy fire, candle light, warm blankets, and a slice of this cake. There’s not much more I could ask for as the weather starts to dip and a chill sneaks in. 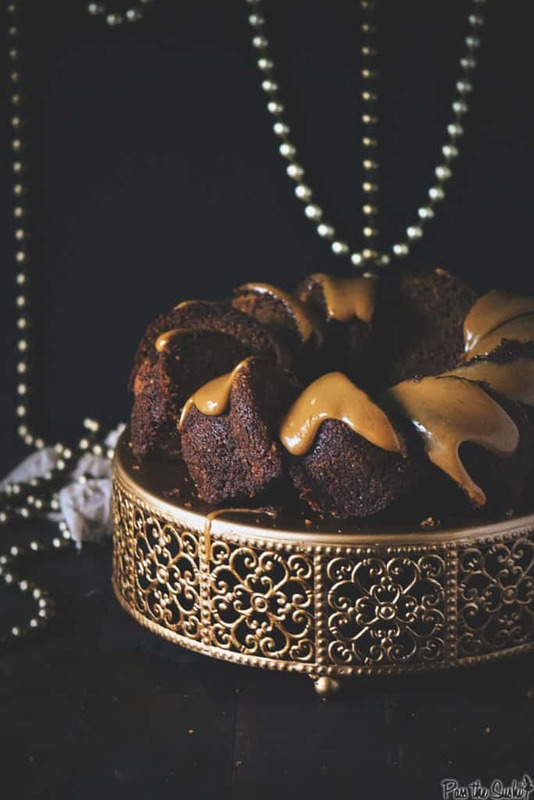 This decedent Rum and Date Cake with Caramel Sauce is what a sinful dessert should be. It looks stunning, will make your eyes roll to the back of your hear, perfect to impress guests, and really, isn’t that hard to make. But, we can keep that between the two of us. 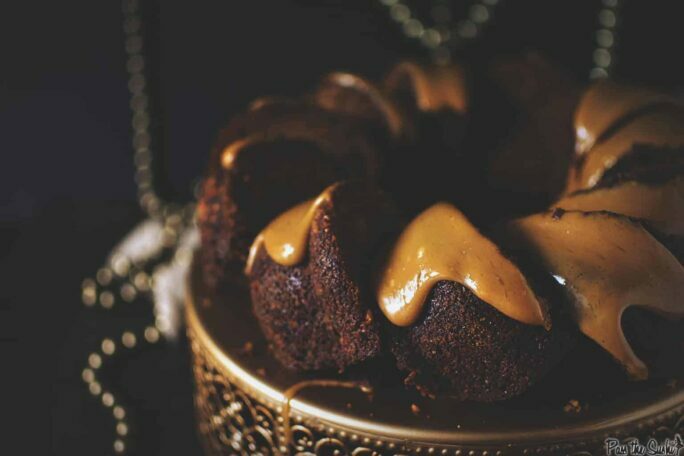 While the days get short and dark and the holidays sneak upon us, add this dessert to the line up. Forget the traditional pumpkin pie and apple delights. 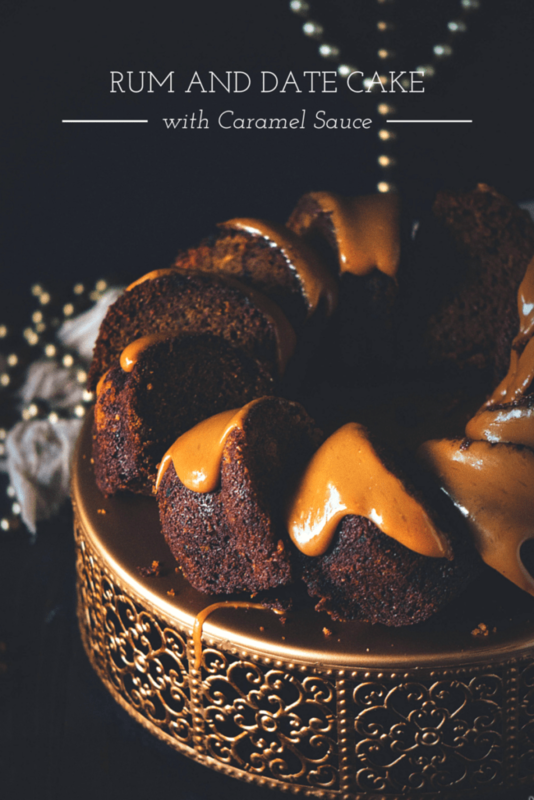 This cake will is all you will need to indulge this season. Preheat the oven to 325 degrees F. Grease a large bundt cake pan and set aside. Pour the boiling water, 1/2 cup rum, and baking soda over the dates, prunes, and raisins in the bowl of bowl of your stand mixer. Let stand for 10 minutes before pulsing into a paste. In a large bowl, whisk the flour and 1 1/2 cups sugar together. Add the 1 cup melted butter, vanilla, and eggs, one at a time, mixing thoroughly. Add the date mixture and stir to combine. Pour the batter into the prepared cake pan and bake for 55 to 60 minutes, until a toothpick inserted comes out clean. Let cool on a wire rack 10 minutes before turning out to cool completely. Meanwhile, make the caramel sauce. In a medium saucepan, place the remaining 7 tablespoons butter with the remaining 3/4 cup brown sugar, golden syrup, and remaining 1/4 cup rum. Cook over medium heat, stirring, until the butter has melted and the sugar is dissolved. Bring to a low boil ( watching carefully) and cook for 10 to 12 minutes until thickened. Cool for 10 minutes before spooning over cake. Slice and serve while still a little warm. That sauuuuuuuuuuuce! Omg. My family would totally freak out for this! Awesome recipe friend! oh my gawd, stunning!!! Damn! I want a slice of THIS cake. Where and when do you use the heavy cream? Making this right now. My house smells so good. A bit late,but for those wondering about the whipped cream, it gets added at the beginning as part of the caramel sauce.